April came to Good Mews when she was a kitten and was quickly adopted. She loved her home and was very sad, when a few years later, her family had to return her because they were moving. They were unable to take April along. April was really bummed for a few days, but we spent a lot of time with her and told her we would find her a new family that will commit to her. She perked up and got really excited and said she couldn’t wait to meet them! Hopefully it won’t take long for this gorgeous girl to find her perfect match. April is a very friendly cat that makes friends easily. She has an outgoing personality and loves socializing. She is also playful and enjoys all kinds of toys. She is a beautiful ball of fur so she will need an adopter that will devote time to brushing her. After her grooming session, she will reward her person with lots of purrs and cuddles. 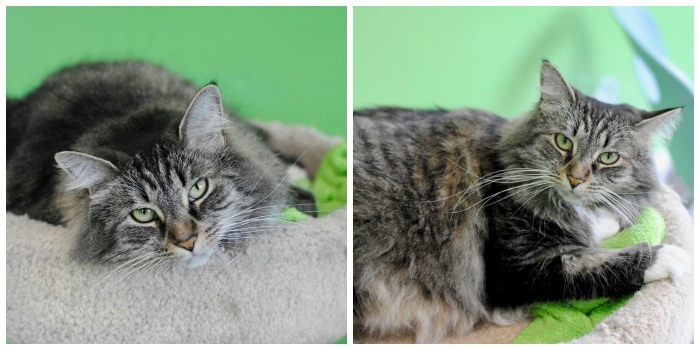 April is a great cat and whoever adopters her will be one lucky family!